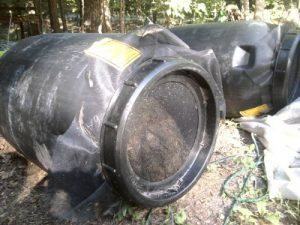 You can make an inexpensive compost barrel using one of the screw-top pickle barrels that are readily available on Craigslist. First wash out the barrel, fill it with plant matter, then place a piece of plastic window screen over the opening and screw the ring back on. Set the solid top aside for other uses. Flop the barrel down on its side in the sun in a place where you can roll it a half turn in each direction. Keep the contents damp but not soggy. Roll the barrel a couple times a week. Mix the contents up occasionally with a pitch fork. We jump start our compost using a gallon of water mixed with some dirt and chicken manure, just to get the bacterial brew going. Pour that into the barrel before closing the top off with the screen. Keep rolling that barrel and the action of heat, air and bacteria will make some good compost for your garden. AND you can roll the barrel to the garden without having to shovel the compost out of it first! The commercial compost barrels with the handle crank are nice, but this costs a fraction of that and works quite well.